This past July my dream came true: I went back to Norway and spent a couple of weeks hiking and camping solo. I think Norway is just the perfect destination for all who love big views, adventure, and beauty. 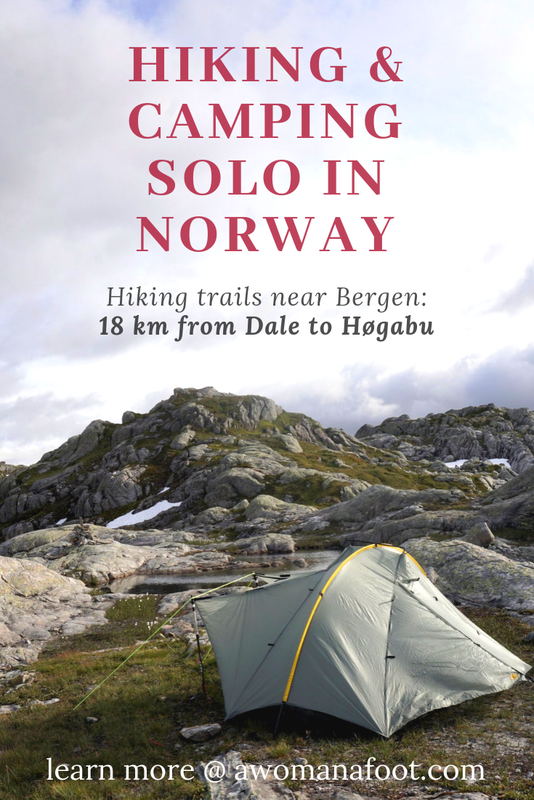 I am a loner who hikes solo and I can highly recommend Norway for all fellow solo hikers and campers! Norway is huge and there is no region which lacks in beauty. I would have a really hard time choosing trails if it weren’t for the fact that I have a friend living there. She lives a few hundred kilometers north of Bergen, so it made a perfect sense to make Bergen my starting point. There are a few trails starting in the city but none of them easily connects with others. I wanted to make a long walk to the Sognefjord, all by foot if possible. As I didn’t want to take a taxi or walk long on roads, I decided to grab a train to Dale and start there. Dale is a small town on the way from Bergen to Voss and is a very good starting point. The downside of this was, that I had to climb up above the fjords… and I soon realized I was horribly out of shape. Although Dale itself is not directly by the fjords, it still is in the valley (the name itself means “valley”) and there is no other way but to climb almost vertically up to reach the main height of the trails through the Bergdalsfjella mountains. I started by getting lost in Dale – it’s almost impossible but I can do things like that. It’s a bit confusing around the train station and not obvious at all which way the town is. There is a store there so it’s a good place to stack on some last minute foodstuff. The trail starts behind the factory buildings and a small bridge. There is an information board about hiking in the area and available trails. The trail starts by going straight up – although there are paths left and right as well, which may confuse a bit. The moment you start climbing, you don’t stop till you reach the top. There is not much of a variety around that part – it’s up, up, up! The challenge is not just the climb but also the terrain - one needs to be careful crossing slippery rocks or climbing up a hand-made ladder. Sometimes the soil was unsure and slippery as well. My backpack was filled with all the food I needed for the next 2-3 weeks so it was not easy for me. The good side was – there was no sunset to worry about and I had plenty of time to make my way slowly to the top. Slowly but surely, I was getting higher and higher. The weather was changing and heavy, milky clouds started to surround me from all sides. The wind blew mercilessly and the moment I reached the first bigger plateau I put a fleece on. The difference in height at that point was maybe 600 m but the surrounding nature changed significantly. No more trees or even bushes. Huge rocks formed by scrapping glaciers were all I could see. Moss and low grasses filled crooks and crannies. The view was limited because of the thick fog but I loved the change in scenery. As much as I love forests, the raw beauty of rocks draws stronger on my heart’s strings. I still had some height to gain but this time it wasn’t as steep anymore. Much bigger of an issue was finding my way. The trails in Norway are marked by a red letter “T” or just red spots (which sometimes looks like something was sacrificed on the rocks). In the area with no trees, it’s the cairns that are most common signage. But when everything around is grey, with milky fog all around, finding the next “T” was at times, not an easy task. Over the next two weeks, I will find it a common thing – looking around in search of cairns and wondering if two rocks one on another makes a cairn or are they just an accidental thing. When a trail leads over rocks it’s hard to spot a path. I tried to train my eyes to see slight changes in the shade on moss or low grasses but most of the time the path was seen rather in the hindsight – after I localized the next trail marker. After a while, I started to look around for a spot to pitch my tent. As it is not a self-standing one, I needed to find a patch of soil for the tent’s spikes to catch a hold. I found one that was more or less the size of my tent, with a slight protection of a bit higher rock next to it. There was a stream made of melting water and I had no problems with preparing my dinner. I’m not sure when the sunset came – I fell asleep before it, with the help of a buff over my eyes. I took my time in the morning. That’s the best part of hiking alone – I didn’t have to adjust to someone else’s plans or needs. I had all the time in the world – and I felt like I was alone in it. I could feel a fantastic sense of peacefulness. The tent was a bit damp as there was the fog and a light rain during the night. There was also a slight condensation - so I wanted to make sure it's dry before I pack it. I soaked up the worst moisture with a small tech towel and the rest dried pretty fast thanks to a nice breeze. My initial plan was to walk towards Hogabu mountain shelter. I didn’t make it there – I pitched my tent a couple kilometers ahead of it. This day was filled with stunning vistas that were all new to me, yet I fell right at home. In the morning the fog made me feel chilly and I had to pay extra attention to find the next trail markers. Around noon clouds lifted and the weather became sunny and gorgeous. Again, I walked slowly, enjoying the views and taking a lot of photo breaks. Thanks to the Nordic summer light, I didn’t have to worry about early darkness – I could take a break and read for an hour while taking in all the surroundings. I meet sheep wherever I hike – Crete, Catalonia, Scotland… And almost always, the moment they see me, they run in the opposite direction. I feel bad about scaring them but that’s their nature. So imagine my shock when a ewe with two lambs instead of running away started running towards me! I had no idea what she wanted – was it some new mother-sheep behavior? Did she intend on charging me? I got nervous and started to go away, hoping the ewe saw me as non-threatening. It’s only when I crossed a stream, the sheep stopped. I looked at them and saw that rather than looking angry or violent, they seemed… disappointed? Weird, I thought. Later on, I met that kind of behavior more often and learned there was nothing to worry about. Those were simply curious creatures, possibly expecting me to be a shepherd or another kind of friendly human. I was still tired from the unrelenting climb the day before, so I was slowly covering the distance. But I had no problems with it – I was happy to walk slowly and observe all the changes in the landscape – snow patches over rocks, countless streams, lakes, undulating hills, and sharp rocks with waterfalls mercilessly beating on them. When I found a lovely spot close to a clear mountain lake, I decided to stop. Høgabu was not far away but I didn’t want to stop in it for the night anyway. I thought it would be a good idea to go there the next day for a breakfast. I wondered what the shelters looks like, as I only read about them online. I loved the evening. Dinner and the most delicious soup (because everything tastes wonderful after a long day of hiking), walking around the area and taking photos of my little camp, evening wash up at the surprisingly warm little pond. A couple of hours spent reading till I was ready to lower the buff over my eyes and sleep. The morning, again, was foggy and cold. I decided to skip the warm food and coffee and walk fast to the shelter. The path took me along lakes and at one point my tent decided to reach for freedom. I stored it in the outside pocket which was really shallow, so it was hard to stuff the tent securely. Just when I was on a very narrow path over a lake, I felt the tent wobbling dangerously. I needed to carefully take the backpack down and try and stuff the tent better. I reached the shelter after about an hour of walk and was surprised to find the porch filled with tiny boots and sneakers. There were three families with kids in varied age spending the night there and getting ready for the day’s hike. The main room was lovely and cozy. In the kitchen, I found water in buckets and pots and kettle for my breakfast. I knew there was a way to pay for the day stay and I quickly localized appropriate forms for card payment as well as a ledger for all tourists passing by this place. I had a nice time reading and eating my breakfast (oatmeal of course ;-)) and drinking coffee. The payment for a day stay is 90 kr. In many mountain shelters, there is also a storage room with long-lasting food supplies you can buy. There are cans with ready meals, instant soups, dry cracker-bread, instant coffee packets, etc. You can learn more about the system of Norwegian mountain shelters here (use google translate) and here. At that moment it’d been only two days of hiking but I was already in love with the landscapes I passed through. How wonderful that I had many more days to get to know a little bit of this stunning land. Dale - Høgabu: 18 km along a trail marked as "challenging". How to get there: train from Bergen and a short walk through the town. Accommodation: You can reach the Høgabu mountain shelter in one day if you are in a good shape and start early on. The payment is about 250kr for a bed, you need to have your own sheets or hostel-style sleeping bag insert. If not - you can wild camp legally in a lot of places. I was lucky that I hiked during a very dry season, so no issues of swampy mud. There is a lot of rock but you can find soil to pitch your tent. Don't take a hammock - there are no trees! If you want to wild camp - please remember you follow the Leave No Trace rules! Have you ever hiked in Norway? Where? Would you want to? Let me know! Share with friends and pin for later!